Munich - Just 40 days after Germany lifted the World Cup trophy in Brazil, FC Bayern München honoured their all-conquering heroes in front of a sold-out Allianz Arena prior to their Matchday 1 encounter at home to VfL Wolfsburg. , , , , Jerome Boateng and Bastian Schweinsteiger all received bouquets of flowers before kick-off, with only the latter two absent from proceedings due to suspension and injury respectively. However, it was another World Cup star who would go on to steal the headlines with a matchwinning performance in the hosts’ 2-1 victory. “Scoring a goal and getting an assist - it couldn’t really have gone any better,” said , who set up Müller’s 37th-minute opener before getting on the scoresheet himself shortly after the break. The 30-year-old only recently returned to full team training after his World Cup exploits with the Netherlands but nevertheless managed to play the entire 90 minutes. “I didn’t think I’d be able to last that long,” he said. “I was worried I’d be exhausted after 20 or 30 minutes but in the end I was able to go the distance without any problems.” By contrast, Götze, scorer of the decisive goal in the World Cup final, ran out of steam in the second half and was substituted off just after the hour mark. His departure coincided with a phase of the game in which the Wolves exerted most pressure, with Ivica Olic’s 52nd minute wonderstrike putting the wind in their sails as the visitors sensed their hosts’ strength beginning to wane. “We had some problems and only had strength in our legs for 65 to 70 minutes,” said coach Pep Guardiola, who fielded an unfamiliar line-up due to the injury-enforced absences of Schweinsteiger, Javi Martinez, Franck Ribery and Thiago. “We don’t have everyone available at the moment and that’s why we’re playing a little bit differently to how we did before,” Neuer told bundesliga.com. “As a result it’s obvious that things won’t be at 100 per cent yet.” The custodian, who was awarded a trophy as Germany’s Player of the Year prior to the game, did not have a completely error-free game, and although he was as reliable as ever when it came to shot-stopping he was fortunate not to concede when Junior Malanda failed to poke home on the rebound ten minutes from time. One player who had no such difficulty finding the net, or indeed with his fitness, was the ever-buoyant Müller. In netting the first goal of the new campaign the 24-year-old continued where he left off in Brazil and covered more ground than almost anyone else on the pitch with a distance of 12.09 kilometres. “In the last ten minutes all we could do was grit our teeth and in the end we managed to bring the result over the line,” he said. And despite having won the biggest prize on offer in football in the summer, Bayern’s World Cup heroes showed no sign of having a diminished appetite for glory this season. 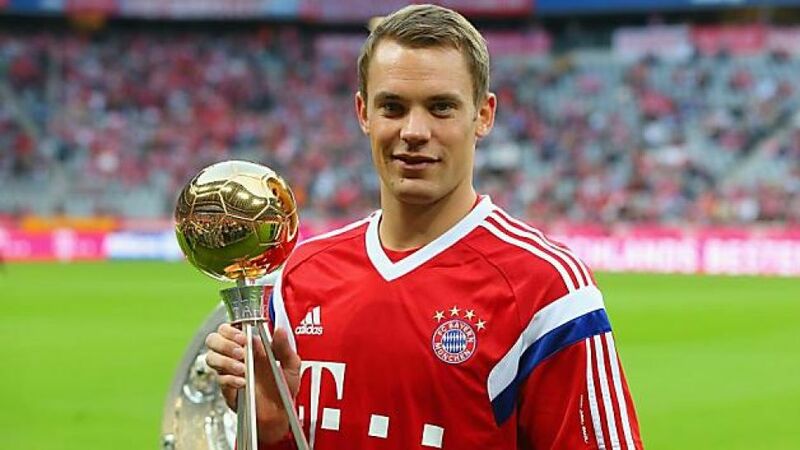 “I’m hungry, I’m motivated and want to be successful this year too,” concluded Neuer. After all, as nice as flowers are, there’s no substitute for a shiny piece of silverware.